So here is it…the last recipe TWD is baking as a group from Baking: From My Home to Yours. I’ve been in the group for close to four years, close to 200 recipes. It’s kind of hard for me to imagine that we are here at the finish line, and I almost don’t know what to say. It’s very true that my week-to-week posts are not as wordy as they were at first, but I have still have been baking (and eating) with the same enthusiasm. I bake professionally, but, as much as enjoy it, it is so much more satisfying to fire up the oven at home and bake for people I know and love. So, thank you, Dorie for your big, beautiful book of recipes, stories and kitchen wisdom. My husband thanks you, too, btw…that guy has gotten quite accustomed to homemade cake and cookies! Thank you, Laurie for your brilliant idea to start this group and to Julie for keeping it running like clockwork. And thanks to my fellow bakers for leaving so many nice comments over the last four years and always being quick to lend advice and suggestions. You have been so much fun to bake with and get to know! Boy, I am talking like we are all done here, or maybe like I have just won an Oscar, and neither of those things are true. Starting in February, TWD is switching to a different Dorie book, the classic Baking with Julia. New members are very welcome, so if you want to join the fun you have a whole month to get the book and get on board! And while we’re on hiatus in January, I’ll definitely be posting a least a few rewinds for the handful of BFMHTY recipes I’ve missed along the way. I almost forgot that there are cookies to talk about! These Thumbprints feature the classic kids’ flavor combo (which I have never outgrown), PB&J. 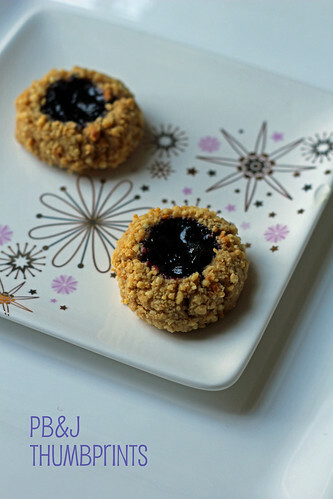 A peanut-coated shortbread-style cookie holds a dollop of yummy jam in the middle. Here, I used the concord grape jam I made back in the fall. These were good cookies, and they served as my Christmas cookies (since they were the only cookies I made). I have some more unfilled doughballs in the freezer, and I think when I bake those I will try filling them with some chocolate in the center. For the recipe, see Baking: From My Home to Yours by Dorie Greenspan, or stop by Dorie’s blog since she is our host for this last week. Don’t forget to check out the rest of the TWD Blogroll! These were a tasty little treat. I’ve enjoyed checking your blog each week. TWD is a great group of bloggers. Thanks! Have a Happy New Year. I’ve enjoyed following the rest of you take this journey with Dorie. Hard to believe that even the last recipe chosen is so great! I’m very excited for the new book. I just made my first recipe from it and it was great. I’m impressed that you still keep up with baking at home on top of baking for work! With recipes this good, though, it must make it a little easier. This has been an amazing baking group! I think we all have grown and stretched ourselves in the baking department!! I have enjoyed your blog and your comments on mine! The cookies, as always, look perfect. Picture perfect cookies! I forgot to thank the hubby for all he’s eaten because where would we be without them? What gorgeous thumbprints! It’s been fun baking with you, and I look forward to thise Dorie rewinds. Your cookies look amazing. Love that plate! Your cookies look lovely, and what a cute plate! It’s hard to believe it’s over, but it sounds like you’re joining the new group. I am too, and am looking forward to it! PB cookies with grape jelly. How perfect is THAT? See you Baking with Julia!! Perfect cookies! I’ll be looking forward to seeing your baking efforts in the next group. Hi Stephanie! What a lovely post to wrap up our wonderful Tuesdays with Dorie adventure. I have to thank you for all your posts and inspiration. I never miss a post of yours and really enjoy your photography and commentary. I loved these cookies too! Rolling them in the peanuts was a fun twist. On to more baking! I will be posting my catch-ups soon too! Ciao ! I loved these cookies too. I cannot wait to sart the new book I’m so happy baking together ! Well – now I know why your treats look so splendid…. a professional! These look wonderfully round – just perfect! Looking forward to BwJ – and seeing more! Your cookies and photo are beautiful as usual. I’ve loved seeing your Dorie treats over the years and am glad to hear my husband isn’t the only one that’s totally spoiled! Wonderful cookies and a wonderful group! It has been great baking along with you and everyone these last few years. Happy new year! What gorgeous cookies! And I love that plate, too. It’s been a lot of fun baking with you all these years! Oooh, those look especially good. Very nice! and I do recommend a chocolate filled version. I’ve enjoyed your blog during this long journey. ohhhh i love thumbprints! yum. Your cookies are so perfect! I’ve enjoyed seeing all of your wonderfully photographed treats each week. Beautiful cookies, Steph! Your photos are always simple, fresh. and hunger-inducing. It’s been a pleasure “meeting” you and baking with you these last two years!